What I would like to do is to throw out some ideas. 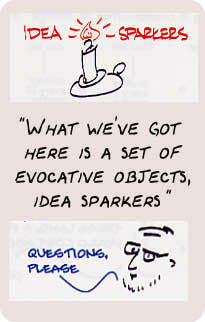 I want to create some evocative objects to think with, as opposed to giving you a very formal type of a talk. I think there is a smattering of ideas here. Some of these will connect with you, and some of them won’t, but I hope that there will be something of particular interest to each person here. I can guarantee that it won’t be the same thing. So this is meant to be a set of idea sparkers. I have become interested over the last couple of years about how in fact you actually capture and leverage knowledge without killing it. It is easy to become over-zealous in trying to capture it, with the beautiful advantage of killing everything. It is also possible not to pay enough attention to capturing anything, and so you lose all the value. There is a tricky balance. In fact, it goes right back to the notion of organizational architecture, that I will come back to, near the end of my talk. And so what I would like to do is start out with a little bit about the context in which we all find ourselves and the accelerating pace of change. And then the key is survival in this kind of confusing world. Everybody here knows about communities of practice but I want to talk a little bit more about that, and come back to learning, to knowledge ecologies, to pick up some of what Steve was talking about yesterday, about a potential fundamental paradox in knowledge management, and a new notion, extending Dorothy Leonard’s notion of creative abrasion in terms how we want to structure our enterprises in order to create the right kind of a balance between stimulating knowledge and losing knowledge. In effect, I found it very interesting, recently, and I think various folks here realize that in the US, there may be a waning interest in knowledge management, just about the same time that when you go to Japan, you find that there is a very interesting movement starting up in Japan. That is that a couple of decades ago, Japan decided to really focus on, and paid very close attention to, Edward Deming and the total quality management movement. And that is what they used to rebuild their entire country. And what is happening today is a shift from a focus on quality to a focus on knowledge. And can you really think through knowledge management, as a way to rebuild the country, not just the enterprise? And so I think you’re going to see increasing emphasis coming out of the East on these types of topics.